Make your trip to London even more memorable with a visit to Madame Tussauds or SEA LIFE London Aquarium with and save up to 35% or try our London Combo Package and get 4 attractions for the price of 2! Explore the world-famous wax museum in London and meet the British royal family, hang out with the Justin Bieber or try the new Sherlock Holmes Experience. Your tickets also include the new incredible Stars Wars Exhibition. At SEA LIFE London Aquarium, you can experience 500 species from all over the world, more than 40 different sharks and 14 themed zones over three floors. It's fun for the entire family! This amazing package deal includes four of London's most popular attractions: Madame Tussauds, Coca-Cola London Eye, SEA LIFE London Aquarium plus the choice between brand new attraction Shrek's Adventure! London or the always popular London Dungeon. Shortly after your booking is complete your e-ticket will be sent directly to your email, just print it out and bring it with you to Madame Tussauds or SEA LIFE London Aquarium. You must redeem your e-ticket at Madame Tussauds at door 2. If you have booked the 4 Attractions Combination Ticket, you'll get tickets for all four attractions here. Madame Tussauds: It's a good idea to visit the wax museum the same day as you pick up your tickets for the 4 Attractions Combination Ticket. Shrek's Adventure: 1) You can choose to get in line, waiting time approx. 10-45 minutes. 2) You can show up at Shrek's Adventure and choose a specific time slot for later that same day or another day. That way you can return to Shrek's Adventure later and avoid waiting in line. London Eye: Check in at the desk for prebooked tickets in the ticket hall (you skip the line to the box office) and wait for the next available gondola. Please note: Your ticket is a standard ticket, not a Fast Track ticket. SEA LIFE London Aquarium: Your ticket is an open ticket, which is valid for one visit on a day of your choice. London Dungeon: Due to high popularity, the London Dungeon has a new entrance policy. Upon arrival at London Dungeon, you’ll be asked to exchange your voucher for a timed ticket for the same day. We guarantee access to London Dungeon either within 45 minutes of arrival or at a date and time that best fits in with your plans. None of our customers have waited the full 45 minutes, but we still offer you the flexibility to plan your day as best suits you. Your tickets are valid for one month once printed at Madame Tussauds. Please note: All tickets must be used on June 6, 2017 at the latest. Yes, children's tickets are available for children between age 3-15. Children between age 0-2 are free when accompanied by a paying adult. - This exclusive offer is valid between April 1 and June 6, 2017 & between July 16 and September 7, 2017. *The deal is based on prices at the door on the day. 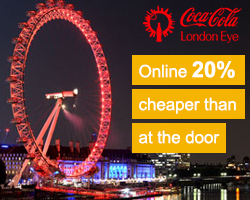 Exchange your e-ticket at Madame Tussauds or SEA LIFE London Aquarium. See where Madame Tussauds is located on the map below.